EndoFit :: Reconstruction :: Products :: Adler Mediequip Pvt. Ltd. 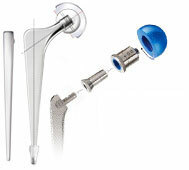 The Adler EndoFit stem is excellent in combination with the moduLoc modular bipolar cups and the Adler modular heads. - Dual Taper, Highly polished design. ENDOFIT stems, Adler Modular Heads, moduLoc Cups and instrumentation incorporate the latest international, state-of-the-art materials, manufacturing, finishing, inspection and packaging technologies in keeping with Adler's Commitment to Patient Safety.